Up until last year, at University, I ALWAYS used to tell myself before I go back to school that; 'This year is going to be different. I'm going to make sure I look good everyday.' All I would want is just a natural radiance and glow to make me look more awake than I actually am in real life. It starts out well during the first couple of weeks then that resolution just crumbles down with my energy. However, at the end of last year I kind of got myself into a makeup routine with which I achieved this look, and this is what I will share with you now. Step 1 - Put a little bit of concealer in areas that you want to cover most. Mainly, for me they would be my pesky under eye circles and any blemishes. I used the Rimmel London Match Perfection concealer. Step 2 - Put on a base and BLEND it well. Now this step depends on the person. If you have perfect skin DON'T put any foundation because you don't need it and there is nothing more beautiful than one's natural skin. If you feel like you need a bit of coverage use foundations that are sheer-medium coverage that would still look light and natural. Foundations of this type would be; Rimmel London Wake Me Up and Essence Stay All Day 16h foundation or if you have oily skin Maybelline Dream Matte Mousse. If you don't need much coverage but you have a bit of redness that you want to even out, like me, you can go for a BB cream or a tinted moisturiser. For this look, I used the Nivea BB Cream 5in1 Beautifying Moisturiser. Step 3 - Powder your face in the areas that you need. This step is important to mattify your look and to make sure that everything stays in its place, because you know it's going to be a LOOOONNNNGGG day. A very good powder, which I used, would be Rimmel London Stay Matte powder in transparent. Step 4 - Draw a fine line on the upper lid outer corner as close to the lashes as possible using an eye pencil or shadow. This will make your eyes look bigger and more awake but not as bold as a liquid or gel liner would look. I used the Essence long lasting eye pencil in the colour hot chocolate. Step 5 - Apply one coat of mascara on your upper and bottom lashes. I put just one coat of Maybelline Vibra-perfection Multi-Effect Vibrating Mascara. One coat was enough because I was not after a dark defined look but just to define and lengthen a bit my eyelashes to awaken my eyes. 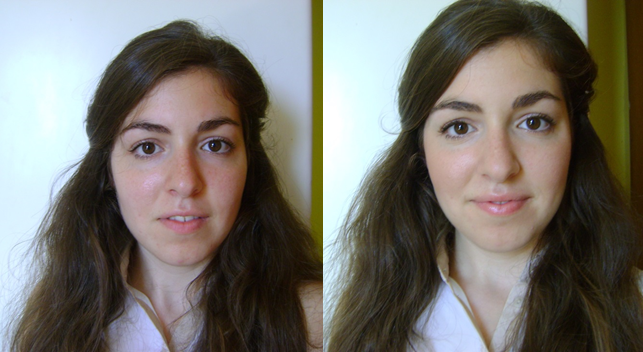 Step 6 - Put on some blusher on the apples of your cheeks and blend towards your hairline in circular motions. Choose a blusher that is not very pigmented but one that gives you a natural radiance and glow. Think of your natural flushed colour....that is the colour you are after, a bit lighter. I used the Pop Beauty BlushBeam Bloom Beam Blusher, a perfect blusher to create this effect. Step 7 - Apply some lip balm. I find that lip balm looks nice because it pops your lips out without adding any colour to them. Some may prefer lipstick but I find that it is a bit more high maintenance and the last thing you would want to be worrying about is whether your lipstick is all over the place or not. Plus, if you're like me and your lips dry up quickly you would rather have lip balm than lipstick on your lips especially in Winter. A mid-way option, where you have colour and hydration, would be Maybelline Baby Lips are a really good option. I didn't want any other colour so I just used my Nivea Essential Lip Care. I hope you liked my 'tutorial' and you find it useful. I know I'm no expert but thought I'd share what I do myself maybe it helps some of you. Please leave your comments. 4 comments on "Back To School Makeup Look"
It definitely does give you a natural radiance and glow :) Very pretty! Oo...thanks for the award :) I will do so.